Share the post "April Stationery Swap"
Back by popular demand! Yes, it’s the #BringBackPaper stationery swap! I love stationery, I adore happy mail, and I know that I’m not alone, so this activity combines the two for us all. It’s easy to get involved. Pop a bundle of stationery bits and bobs together, and send them out into the world to your swap partner so that they have received them by the end of April. You can include whatever you fancy, such as notepaper, jotters, stickers, pens, washi, postcards – whatever suits you. We’re not talking huge amounts and box loads of stuff here, just a pretty little package to brighten someone’s day, spending around £5. 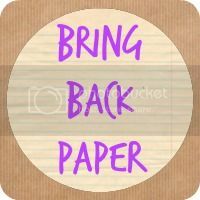 If you’d then like to share either sending or receiving, just use the #BringBackPaper hash tag over on Twitter or Instagram, or share on my Facebook page so that we can all see it. This swap is open to absolutely everyone worldwide, and you need not blog or be active on social media to take part. You just need to enjoy stationery. To get involved, email me with your name and address at jocelyn@thereadingresidence.com, and I will then pair you up and get back to you with your swap partner’s details as soon as I have done so. It’d be really helpful if you could let me know whether you’d be willing to or would prefer to post internationally, too, as we do often have swappers outside of the UK wanting to get involved. Have just sent an email over, really looking forward to this! Thanks so much for organising, I’ve just sent you an email so excited to take part ! YaY! I love that you all love paper as much as me. Sending you an email.